Do you need Sax?? Do you REALLY Need Some Sax?? And Do you NEED that Sax to make beads of sweat run down your face, to make your heart race and your legs quiver? Well, you've come to the right place. Paul L'Espérance is the entire horn section of the Jello Shots and if you haven't caught on yet, he plays sax, tenor sax to be specific. Whether he is giving you that smooth sultry tone in a slow moving ballad or that heavy, rough growl that only a tune like "The Business of Love" can evoke, he always knows just what kind of Sax you need. He should know by now, why you ask? 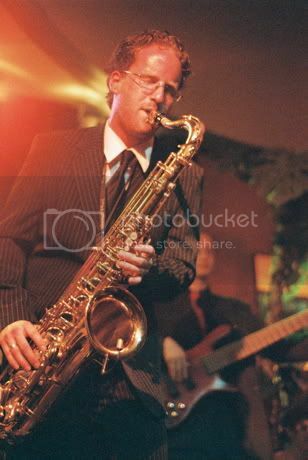 He began his professional music career as the Alto Sax player for the famed 9-piece Montreal Swing Band "Kamikaze Mustang" (now defunked). Joining the band a the age of 17, he was in fact playing shows, concerts and gigs in places he wasn't actually allowed to be in yet. However, this early start gave him a much wanted foot in the door as his five year stint in the band is what lead to acquaintances with Jello Shots guitarist Brian Cascarano and singer Mark Hauser. Paul has in fact known rock-solid Jello Shots bassist Marc Weber and heavy-hitting drummer Nick Thompson for much longer than that as they went to high-school together out in the town of Hudson just west of Montreal. Paul attended Vanier College where he received his formal education in the music field. Studies in Jazz performance, improvisation and composition have allowed him to greatly expand his abilities. He is currently refreshing his hand in composition: do I smell original Jello Shots material on the way? His roots truly lie in Jazz, Blues and Funk and he won't let other band mates forget it either as he constantly hounds them to play more of those styles... don't be surprised if you hear a bit of all of those genres at one of the Jello Shots' action-packed shows as he's pretty relentless in his quest for that stuff. L'Espérance enjoys being the only horn in he band as it allows for a lot more improvisational freedom. Of course sometimes he does have to remind other band members that, as a human being, he requires oxygen... so holding that last note does eventually have a limit. That limit is frequently tested even at shows and events, so keep an eye and ear open and see what jello flavor his shade best represents. Hell, it amuses the rest of the band. Paul is the Jello Shots' offering to keep those SAX-crazed fans as excited and charged to be at the show as they are to be playing it. So if you love that sweet-sweet-mellow-saxophone sound, or that gritty-in-your-face-teeth-on-the-reed scream, then a Jello Shots' show is definitely where you'll find it. So there's only one thing left to ask yourself: are you getting enough SAX these days?